When it comes to strength and exercises like Deadlifts you are only as strong as yuor weakest link. For a lot of women when it comes to deadlifts their weakness is not their legs or their hips, it’s their grip. While I think using lifting straps have their benefits in training at times having a strong grip will carry over into everything in your training and strength, so focusing on improving your grip is very important. Too often I have seen women using straps for all of their deadlifts and not allowing their own grip strength to match their strength. If you are a women who can deadlift 300 lbs with straps but you can’t deadlift 275 without them, then we have a problem. Try to do a lot of your deadlifting without straps. As well when warming up and until you get to your heavy weights use an over/over grip. This will help improve your strength and reduce injuries in the long run. As well when things get heavy and you use a over/under or mixed grip try to change your over/under hand every set. I am guilty of deadlifitng for years with the same grip and over time this can cause wear on your body,. 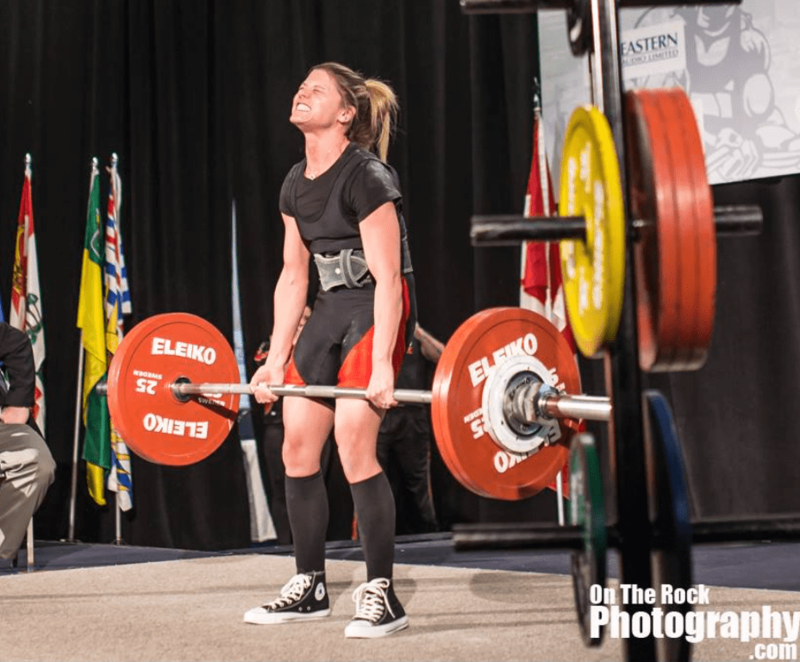 READ How Often Should Women Deadlift For Optimal Results? On your working sets of deadlifts hold your last rep for 5-10 seconds in the top of the deadlift. This is a simple and effective way to use the deadlift to improve your grip strength. Don’t bother doing this on your warm up sets, but on your working sets, especially your last few sets this will help your grip strength. Important, always know when to push, and when to not push on your deadlifts. If you feel your grip going know when to fight for it and know when it’s ok to let go. Always remember the LAST THING you want is an injury. When training no matter what exercise you are doing practice squeezing the bar as hard as possible or “white knuckling” the bar. If you are doing bench press squeeze the bar tight, if you are doing pull ups squeeze the bar as tight as possible, if you are doing squats squeeze the bar as tight as possible. Every time your hand touches a bar or dumbell practice squeezing the hell out of that bar. One of my athletes I coached with a HUGE Deadlift of 189.5 / 417.5 lb in Open 72 kg division setting a New Canadian National Record at NL. Provincials 2015. 4. Use Thick Bars or Fat Gripz In Your Training. In THIS blog post I talked about the benefits of using thick bars in your training. However if you don;t have access to a thick bar (they are not cheap) then the next best option is investing in Thick Grips or some type of thick grips tool you can use in your training. They will improve your grip strength, and also reduce your injuries. Trust me when I say you do not want tendonitis or anything like it. Recently in my training I was using a standard bar all the time and nothing else and my arms got so bad I could barely train or hold on to the bar. I took some time off, made ice and aleve my friend and added in some thick bar and fat gripz into my workout and it made a huge difference in my strength and reducing my injuries. I love weighted carries and use them myself and with all my clients. They will improve your strength, your grip, and also improve your mental strength. Adding weighted carries into your program is very beneficial. Vary it up with Farmers Walks, Kettlebell Carries, Dumbell Carries, Single Arm, Double Arm and more. For more info on Weighted Carries check out my article on T-Nation.com The Farmers Walk Cure. Michelle & Heather with some Strong Farmers Walks today. Heavy carries do the body good! Always remember your only as strong as your weakest link and everyone can benefit from improved strength and grip strength. If you are looking to improve your deadlift then be sure to improve your grip and always remember this quote from Rich Sadiv “Don’t Let Go Of The Bar“. I hope you enjoyed this blog post, if you did please comment, like and share. Download 10 Tips For A Stronger Deadlift.